Ther is no internship nothing in JSS Academy of Technical Education, [JSSATE]. The companies which will come to hire you are cognizant, MindTree, cap Gemini, Accenture, IBM, etc Salary figures are around 3 Lakhs Per Annum. Alumni network has done the moderate job in finding companies for placements. I wish they find more in next years. 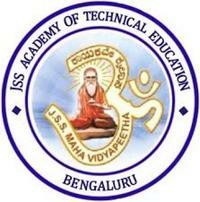 I haven't done any Internship for my course at JSS Academy of Technical Education, [JSSATE] Bangalore. The Key companies that conduct recruitment process at JSS Academy of Technical Education, [JSSATE] Bangalore are Accenture, IBM, CTS, Schneider, Collaberal, Wipro, Tech Mahindra, GAP, Gemini, Mindtree, Amazon, Adobe and much more. The average salary ranges from 2 to 3.5 lakhs. Maintained By 3RD Party Software, Alma Connect helps in notification of all events.